This is the only plasma TV in the 2014 lineup to have a fully loaded feature set. The 60PB6900, only available in the 60 inch size, has all of the standard smart TV features and 3D playback. We are happy to see plasma TVs still in production after Panasonic has pulled out of the race. Many still prefer the picture quality of a plasma over LED technology. The 60 inch PB6900 is a decent value priced at around $1,150. The picture quality on LGs plasma TVs has improved significantly in the past couple years and the 60PB6900 series picture emanates a beautiful plasma image. It is common knowledge that plasma TVs are dim compared to LED TVs. LG's plasmas are typically less brilliant than Samsung's. For that reason they may not look great in the store. The key is getting the TV into a darker room at home. This is where colors and black levels will really come alive. Your living room is a lot different that a showroom floor and those LED are all on torch mode to make them look so much brighter. You would not use the TV in that way at home anyway. The 60PB6900 delivers some smooth contouring and though the upper limit of brightness is constrained it has a nice depth perception. Black levels are average on this TV for a plasma and better than most LCD TVs. All that being said, the LG 60PB6900 does not have as good brightness, light flow through and color saturation as 1080p Samsung and Panasonic plasmas. 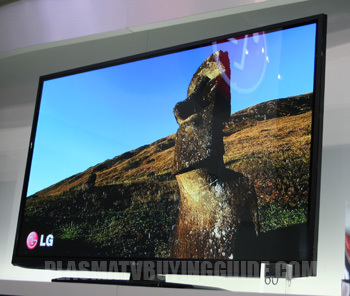 This will be the only Active 3D enabled plasma TV from LG this year. It is important to not that they call this one 3D Ready. That means that there are no 3D glasses included in the box. Active 3D glasses are pretty pricey and will be an additional purchase if you plan on utilizing the feater. As far as 3D performance goes, LG has always been strong. Expect to see phenomenal 3D effects with excellent depth here too. The depth of 3D images has always impressed us while reviewing these plasmas. LG's 60PB6900 has a pretty standard design. It's not as flashy as the Cinema Screen designs seen on top tier LED entries this year. It's got thin black bezels around the display that create an almost borderless look. At 2.7 inches in depth, it's not the thinnest around. That's typical for plasma TVs though. The stand is a black square that stits at the center of the display. You won't have to worry it the stand is too wide for your TV stand here. The 60PB6900 is an average value, but the only choice if you are looking for a 3D plasma TV this year. Points have certainly been knocked off for not including 3D glasses in the box. As far as picture quality goes though, this one is a winner. The Samsung PN64H5000 is a competitor this year, although it doesn't feature 3D or Smart TV. The LG 60LB7100 is a good comparison LED model. Dimensions without Stand (WxHxD): 54.8" x 30.0" x 2.7"
Dimensions with Stand: 54.8" x 34.7" x 13.4"